Great game yesterday. I thoroughly enjoyed it–although I would have liked a different outcome. So now shall I be the spoilsport, the Donnie Downer, who rants about how the Super Bowl epitomizes every challenge we face combating climate disruption? For a single day, the sum powers of our fossil-fueled technology are brought to bear on this primal spectacle. Planes, satellites, telecommunications, computers–all the most sophisticated machinery in human history, fueled by oil, coal, and gas, are put in service of an ecstatic audience watching a handful of purebred mesomorphs lope and collide. It’s prodigality on a planetary scale. Yet I was there, brew in hand, screaming at the screen. And enjoying every minute of it. If this isn’t the essence of our climate dilemma, I don’t know what is. I’m not going to scold anyone for watching the game. The Superbowl is fun. It’s a touchstone that brings people together, however superficially. May there be many more. My point is, humans instinctively want to feel good, now. They don’t want to worry. They don’t want to be anxious. They want to be with other humans. They want to be outside their own concerns, to be in ecstasy. Humans just want to have fun. And because we’ve grown up in this world of technology, energy is as ambient to us as the air we breathe. 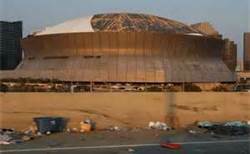 The game took place in the Superdome, a gargantuan structure hulking atop the alluvial fan of the ever-changing Mississippi River, just a mile or two from the hurricane-prone Gulf of Mexico. A streetcar line runs nearby, but you’d wait a long time to fill its 72,000 seats depending solely on New Orleans’s cute little trolleys. It was specifically built to host this one game (hence the name), though it’s used for other spectacles, too. It is a very large, very energy-intensive, limited-purpose venue built for excess, plopped into a very inconvenient place. Maybe the most telling detail is the architecture. With its dome, it looks like a giant UFO landed among the hotels, parking lots, and causeways near the French Quarter. The dome allows an outdoor, daylight game to be played indoors in artificial light with manufactured weather, all for the comfort of the fans and the ease of broadcast. 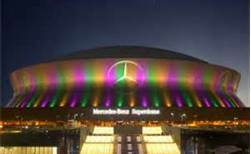 Super Bowl XLVII purported to be the “greenest” Super Bowl ever. Among other things, the local utility purchased carbon offsets for the power the stadium used (4,500 megawatts per hour, enough to power a city of 4.5 million people), team travel, and the hotels linked to the event. It also created a website called Geaux Green where individual travelers could do the same. I suppose these actions are to be lauded. They’re certainly better than doing nothing, and you can argue they raise consciousness. But the consciousness they raise is that the climate crisis can be solved by one-time incidental efforts. It had the feel of a fig leaf or an indulgence, a way to rationalize the Dionysian excess, to take it out of time and space and make it special, almost sacred. 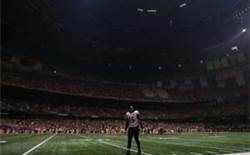 The power outage in the second half reminded me briefly of Hurricanes Katrina and Rita.Without power, the narrow purpose of the building became immediately apparent. It was built to do one thing: focus eyeballs on a gladiatory arena for a few hours. Once it was unable to sustain that purpose, a vague anxiety crept in. I can’t imagine being herded there after the devastation of the hurricanes, fighting the design of the building just by trying to eat and sleep, let alone to get medical care or carry on anything resembling normal society. What if we had no domes? What if we reverted to football the way it was invented: an outdoor game, played in the fall, with the randomness of the elements an integral part of the game? What if every field were like Lambeau Field in Green Bay? We wouldn’t be using enough power for a city of 4.5 million. And we’d be in touch with the environment, not isolated from it. It’d be a subtle and continual lesson in hubris and humility, that we’re not above nature and can’t control it, that we should embrace it. We’re in the atmosphere. We can’t escape it. Ultimately, whatever we do to it comes back to us. To use an analogy from another sport: Mother Nature always bats last.